Keeping kids engaged in after-school activities and sports helps improve grades and overall wellbeing. Unfortunately, these activities aren’t cheap. According to a Global News study, Canadian parents spend an average of $1,120 each year enrolling their children in extracurricular, community and sports activities. According to the same study, many families are over-extending themselves to pay for it all; with over half of parents saying the cost of kids’ activities puts a strain on their family finances. So the question is: How do you keep your kids active during the school year without putting yourself in debt? There are a lot of options out there for families on a budget. You just need to know where to look. KidSport is an Edmonton-based organization that helps remove financial barriers that prevent kids from playing organized sports. KidSport helps with registration fees and provides access to equipment for kids up to the age of 18. The City of Edmonton has also introduced something called the Leisure Access Program (LAP). LAP helps low-income Edmontonians access participating recreational facilities through an annual or subsidized monthly pass. There’s also the Align Association of Community Services, which offers discounted products, programs and activities for low-income Albertans. Many recreational leagues and sporting organizations also offer the ability to waive or discount registration fees depending on the situation. You can always ask about a payment plan option or barter the fees, depending on the group. The point is, you have choices. Asking the right questions and doing a bit of research online can go a long way. Forget buying brand new equipment. Dozens of sports stores offer used items for a fraction of the price. Hockey sticks, skates, rackets, cleats… you name it. There is nothing to be ashamed of when buying used. In fact, most stores recondition their used product before it goes back on the shelves so it’s just like new. If you can’t seem to find what you’re looking for, you can always resort to cheaper-than-in-store online bargains! There are also charitable organizations in Alberta whose mission are to provide low-income families access to sporting equipment they otherwise can’t afford. For example, Sport Central is a volunteer-driven organization that provides sports equipment at no cost to kids in need. After-school programs help improve kids’ grades, improve their social and communication skills and help them make healthier choices into adulthood. 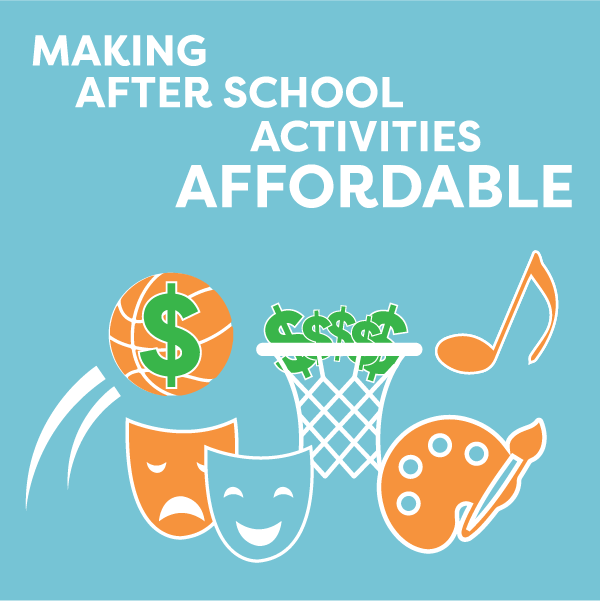 While there are a lot of after-school program options, many of them can cost an arm-and-a-leg. Luckily, there are a few community organizations that provide free after-school options. Kids Up Front is an Edmonton-based none-for-profit that works with organizations to provide child and family services for free, for families in need. They work with groups like the Bashaw Youth Foundation who provide low-cost after-school programming and the Boys & Girls Club Big Brothers Big Sisters of Edmonton, who provide a diverse array of mentoring and after-school programs to meet the needs of youth. Just because your family is struggling to make ends meet doesn’t mean your kids shouldn’t be able to experience the benefits of after-school programs and sports. At Cashco Financial, we provide several alternative financial banking options that help families save and put money away for extra-curricular activities. The Mom Match Savings Account is a free savings account that matches every $10 you put in – up to $120 per year. There is no monthly fee and no credit check to sign up. We also have the Buy Some Time program which lets you skip a payment on a loan every six months with no fee attached. In fact, you also get access to our monthly loan payout program in case you decide to pay out your loan in full; with no penalty. Enrolling your child in programs and sports is so important. It helps their bodies develop and nurtures their brains so they can perform well in school. There are dozens of options available for families and parents on a budget who are just trying to make sure their kids have the brightest future possible. Let us help you and your kids make the best of this upcoming school year. Sit down with one of our Cashco Financial Specialist today and ask us how we can help you and your family plan for a brighter tomorrow. Read more on 11 Back to School hacks for busy parents and how to meal prep school lunches in a budget friendly and cost effective way.